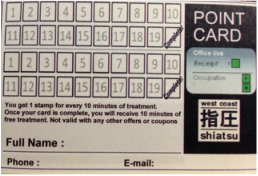 West Coast Shiatsu Clinic has Point Card System. Receive a point for every 10 min session at our clinic. when you finish collecting 20 points, we will give you a 10 min free extension on your session!! Just come in to our clinic and sign up for a card to get started. *Not valid with any other offers or promotions. *A minimum 10-min session required.